Big achievements in the HEAT at High Octane!! Big congrats on some big titles earned at the High Octane trial in Doylestown, PA this weekend!! Saturday, eliminating any suspense by nailing her first regular run of the weekend Debi and Chime finished their NATCH-5 ! And to make a nice pair of matching ribbons they got Weavers to finish her Versatility NATCH-4!! You go girls! 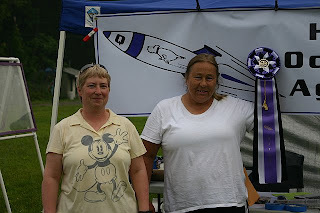 Debi was on a roll this weekend, because Garen finished his Novice Triple Superior (a.k.a. "Novice NATCH") on his first regular run today!! Leanne and her auss-ome Mini Aussie Cody also finished their Novice Triple Superior and Novice Superior Versatility on the same run! Cody made his debut in Elite this weekend in Elite Jumpers with a bang, bringing home 2 Qs his first time out. What an amazing team. Last, but not least. Charlotte and Raven finished their VERY FIRST TITLE today! They earned their NJC with a first place Jumpers Q and a very pretty run it was indeed. There were many beautiful runs in spite of the punishing heat, and also many good decisions made by people in the interest of their canine partners. All in all, a great weekend at High Octane! Word has it that Nelson Hardy and his speedball Eskie, Hattie have officially earned that last pesky Jumpers to complete their Platinum Speed Star! I believe this was also Hattie's Platinum Versatility Speed Star as well. Way to go guys!! Not to be outdone, Debi Hutchinson and Josh have earned their THIRD Platinum Speed Star! WOOHOOO team! For those of you that don't know, a Platinum Speed Star requires 20 Regular, 10 Jumpers and 10 Chances, all of those Q's have to be with a DRI of 100+ (except for Chances, which has no DRI). For the Versatility, you add 10 each of Touch-n-Go, Tunnelers and Weavers. This is no easy feat and it showcases the few teams that possess extreme speed and consistency. We just happen to have at least 4 teams in our club that have earned this award, 3 of them multiple times over. And a few more that are right on the edge of earning it. Great job team PZ!! New PAWZAZZ blog is up and running! Welcome to the blog, here we will keep you updated on the latest news and brags from the club. It is the latest addition to the ever growing PZ website. Enjoy!